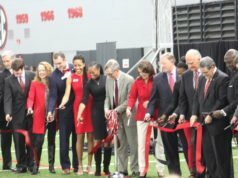 ATLANTA, Ga. – The seventh-ranked Georgia Bulldogs overmatched the Georgia Tech Yellow Jackets 38-7 in the battle for the Governor’s Cup Trophy Saturday at Bobby Dodd Stadium. The Georgia (11-1, 7-1 SEC) win marks its ninth-straight win over the instate rival in Atlanta dating back to 2001. 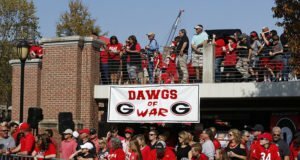 Georgia Tech’s season concludes with a 5-7 overall mark, a win shy of bowl eligibility. The Bulldogs used a balance attack offensively with 224 passing yards and 247 rushing yards. 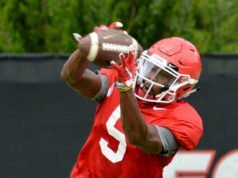 Freshman quarterback Jake Fromm went 12-for-16 in the air for 224 yards and two touchdowns, while senior wide receiver Javon Wims led the team in receiving with 77 yards on five catches and a score. Six Bulldogs recorded rushing yards, five of which had more than 20 yards. Senior tailback Sony Michel had a team-high 85 yards, senior back Nick Chubb tallied 53 yards and freshman running back D’Andre Swift notched 37 yards – each with a score. Sophomore running backs Elijah Holyfield (35) and Brian Herrien (17) along with Fromm (20) rounded it out. Defensively, junior inside linebacker Roquan Smith collected team-high nine tackles including three for a loss and one sack. Fellow linebackers D’Andre Walker and Natrez Patrick chipped in six and five tackles, respectively, while Deandre Baker recorded the only takeaway with a second-half interception in the GT end zone. After forcing a Yellow Jacket punt on the game’s opening possession, the Bulldogs coordinated a 12-play, 61-yard touchdown drive. Chubb scored from one yard out, while Michel compiled 25 yards on the drive including a critical 3rd down pickup where he shed two tackles. Georgia Tech put together a 12-play, 56-yard drive that started in the first quarter and spilled into the second quarter, but boiled over with a failed fourth-down attempt. The Bulldogs turned it into a touchdown quickly with six-straight run plays for 44 yards and then a 21-yard pass from Fromm to Wims for the score. The Yellow Jackets got on the scoreboard in the final minute of the first half on a 10-yard touchdown pass from TaQuan Marshall to Ricky Jeune. The Bulldogs offense moved efficiently with 42 seconds left setting up a Rodrigo Blankenship 37-yard field goal to head into the half with a 17-7 lead. At the half, Fromm was 8-for-10 for 91 yards, while Wims had four catches for 61 yards and his team-leading 6th receiving touchdown of the year. Michel tallied 67 yards on the ground on eight carries to move up to third all-time in rushing yards behind Chubb. Georgia scored on three of its five possessions in the second half to seal the victory. The only non-score drives consisted of a punt and the final possession in which Georgia controlled the ball for 7:19 leaving GT the ball with only seven seconds left. Michel tallied the first touchdown on a four-yard run after a 39-yard catch by sophomore receiver Mecole Hardman set it up. 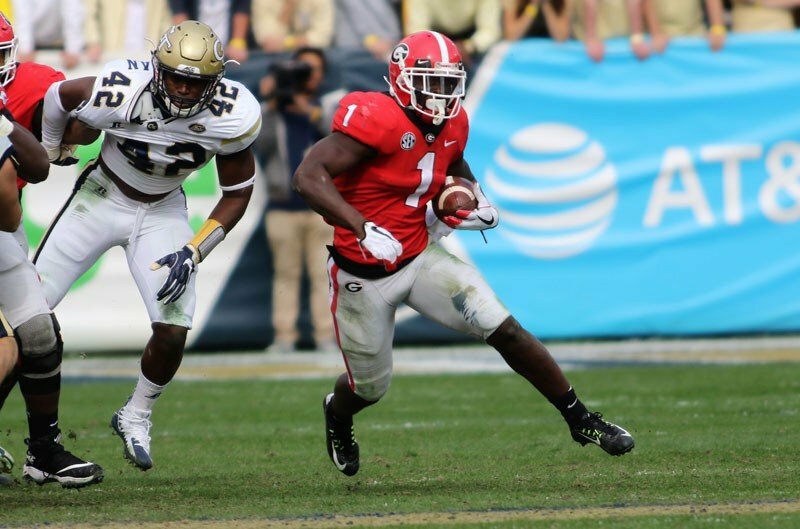 In the subsequent drive, Georgia marched down the field 67 yards, all but five yards on the ground. Swift highlighted the last two plays with a 31-yard run on a 3rd-and-9 and an over-the-top 2-yard score. The final score came on three plays as Fromm connected with junior college transfer receiver Ahkil Crumpton for a 78-yard touchdown strike, Georgia’s longest of the season. Georgia competes for the program’s 13th SEC title next Saturday against either Auburn or Alabama at Mercedes Benz Stadium in Atlanta. Kickoff is scheduled for 4 p.m. and will air on CBS.